This system of blocks, tracks, and pieces allows the creative energy of a marble to travel and make your child's own path. 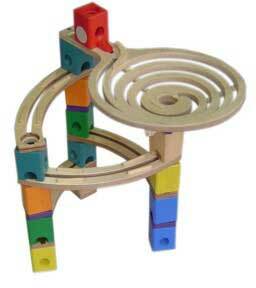 The wooden tracks and rainbow colored blocks each have different functions, the starting point for endless ways to create a marble drop. You can go right or left, swirl in a funnel or poor out of a teeter totter. The path is determined by the builder. There are simple two or three-level switchers or complex multi-level, multi-direction layouts possible once the builder understands the function of each piece and are able to create it. The basic set is perfect for the child who has just grown beyond blocks and still likes adding and creating his or her own designs. 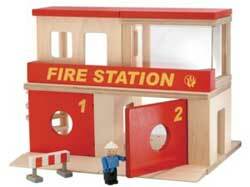 This firehouse with mini firetrucks, firefighters and other pretend props is part of a new line of wooden pretend settings that are ideal as props for block building and pretend play. Also notable in the line is a police station and hospital, the latter with heliports and their own vehicles and figures. They can be taken apart and rebuilt, but this takes some dexterity and adult help. That said, these are handsome. Look for the construction trucks, too in bright yellow.